Well that only took 18 years....read more here. Saudi Arabia offers few prospects for the bright young Mohammed El-Gharani. With roots in Chad, Mohammed is treated like a second-class citizen. His access to healthcare and education are restricted; nor can he make the most of his entrepreneurial spirit. At the age of 14, having scraped together some money as a street trader, Mohammed seizes an opportunity to study in Pakistan. One Friday in Karachi, Mohammed is detained during a raid on his local mosque. After being beaten and interrogated, he is sold to the American government by the Pakistani forces as a member of Al-Qaida with links to Osama Bin Laden, but Mohammed has heard of neither. 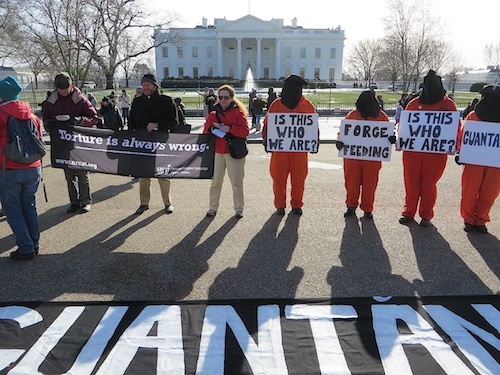 The Americans fly him first to Kandahar and then to Guantánamo Bay. In Guantánamo Kid, Jérôme Tubiana and Alexandre Franc tell the eye-opening, heart-wrenching story of one of Guantánamo’s youngest detainees. Written in collaboration with Mohammed El-Gharani, Guantánamo Kid reflects as closely as possible his memories and experiences of life in the camp. Read more about his memoir and buy a copy here. Not if freedom means that you are free to travel. A point that Mohamedou Ould Slahi has been reminded. You might remember Mohamedou- he was a prisoner at Guantanamo who wrote a book... a heavily redacted book (I will try to find my earlier posts about his ordeal and his book later this week....) He was finally released in 2016 and his country (Mauritania) promised that after two years his passport would be provided to him again. That is one of the many tragedy's that continues to haunt they former prisoners. Here is a link to my post after Slahi republished his book. The US House may be busy bashing Trump, but nothing will happen in the senate so long as the intensely partisan Mitch McConnell remains Senate Majority Leader. McConnell is personally credited with packing the federal judiciary, beginning with the supreme court itself, where Republican loyalists have since signed off on Trump's "Muslim ban", and seem prepared to green-light the illicit motives underlying "national security" declarations, and such recent Trump initiatives as the rigged census questionnaire; the immigration "national emergency"; and an Army-built border wall. If the courts rule against Mr Trump's national emergency executive order, will it make any difference? He recently openly flouted a federal court order striking down another executive order excluding aliens. While the supreme court has unique internal dynamics, it is the lower courts that are suffering the most from McConnell's systematic stacking. Alarming appointees, chosen for conservative ideology, are being nominated and confirmed in droves; some are destined to be forever tainted as "Trump judges". One of the most unsuitable, Howard C Nielson, is a nominee for US District Court in Utah. Nielson once worked in the "torture memo" section of George Bush's Justice Department; his contribution was a 29-page memo implausibly (and wrongly) claiming that the 4th Geneva Convention only applied to those civilians detained on US territory, leaving US detainees in Afghanistan unprotected.